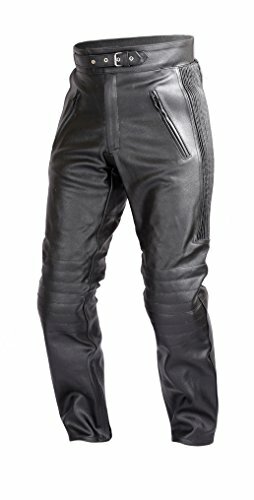 This is a pair of highly comfortable leather pants that offer maximum protection and abrasion resistance. Accordion style stretch panels on sides and lower back are great for freedom of movement and adjustability. Elasticated fabric behind the knees provides optimum comfort. CE rated four piece armor for hips and knees come pre-installed. These pants are backed by our Lowest price, Highest quality guarantee. 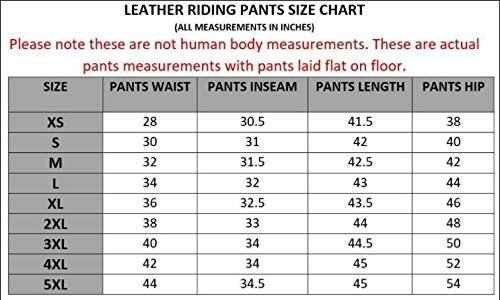 This simply means you cannot get this price and quality from any other seller.Leather pants DO NOT fit the same as your regular jeans. So your regular jeans or pants measurement is totally irrelevant. Measure your waist at belt level using a cloth tape measure and don't pull it tight. Pick your size by comparing this measurement to the size chart. If your waist measurement falls on borderline between two sizes, go for the larger size. Feel free to send us a message if you have any questions. If you have any questions about this product by Xtreemgear, contact us by completing and submitting the form below. If you are looking for a specif part number, please include it with your message.